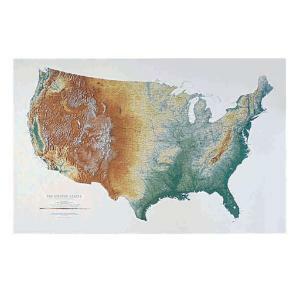 Impressive, Extra-Large Wall Map of the Continental U.S. Informative and accurate, the stunning map of the U.S. is also a work of art. Examine it up close, and you’ll see the names of mountains, rivers, lakes, cities, even roads; or view the map from a distance to observe the special shading highlighting the landforms, giving the map a three-dimensional appearance. Painstakingly created with rich colors and exceptional detail, the remarkable map will be a valuable addition to your classroom. Laminated for years of use. Scale: 1:3.5 million. Size: 37" x 58".